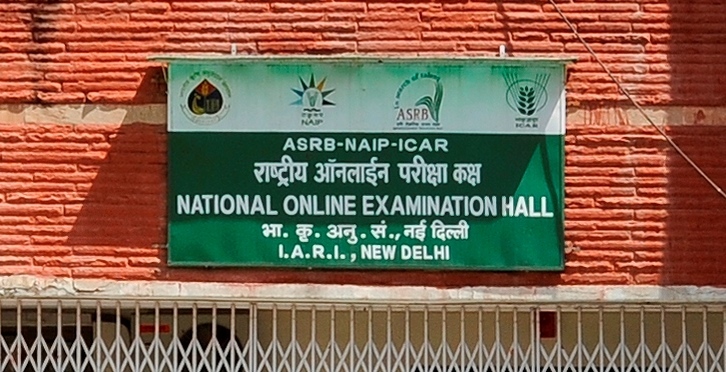 ASRB online Examination Centre at IARI has being established under the sub project "Developing, commissioning, operating and managing an online system for NET/ARS –Prelim Examination in ASRB, ICAR" of National Agricultural Innovation Project (NAIP) funded by World Bank. Under this project, a network of 23 Examinations Center at various ICAR Institutes and Data Centre at ASRB, New Delhi has been established to conduct National Eligibility Test (NET) and Agricultural Research Service (ARS) preliminary examinations in various disciplines of agriculture science. The backup data Centre of main ASRB is also hosted at IARI. IARI, New Delhi is one of the finest Online Examinations Centre with a capacity of 120 students to appear at a time for examination. This centre is fully air-conditioned well equipped with 120 desktops along-with its latest accessories, uninterrupted power supply (power backup from one 20KVS UPS & one Generator), two LED screens etc. The centre also has CCTV surveillance system (6 IP PTZ dome camera and four IP based IR dome camera. Till today, three online examinations have been conducted at this centre by ASRB, New Delhi. ARS-2014 (Preliminary) & NET-2014(II) during September 22-28, 2014 (daily three slots).